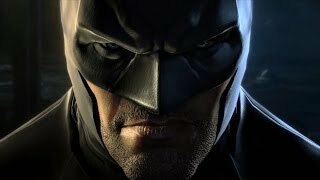 Batman: Arkham Origins (The Movie). Лучшие мультфильмы. Все видео пользователя: Andy Gilleand. If you've never seen my movies before, what I do is try to tell the story of the game in movie format. The idea is to present the story in a way that feels complete and can be understood whether you've played the game or not. I capture the entire game's story, and edit together cutscenes and gameplay. The cutscenes obviously drive the story, but if you just show the cutscenes, you will be left confused as to what happened between cutscenes most of the time. So gameplay is necessary, but I do try to keep gameplay to only the minimum I need to tell the story. If I can find areas to cut down on that don't affect the story or the pacing of the movie, I will. I also try to keep the experience as close to a proper movie experience by removing anything that makes it super obvious that you're watching a game. Obviously, it includes gameplay, so that can only go so far, but I can remove HUD elements, button prompts, any on screen text or loading/saving indicators, etc. Thankfully, due to an ini file tweak in this game, I was able to entirely disable the HUD. For everything else that remained, I was able to either edit around them or use visual effects to remove them. The game does dip below 30fps in a few spots when a lot is happening on screen, especially when the more advanced effects are used, but for the most part it stayed at a pretty solid 30fps. I used a 30fps cap because I was recording at 30fps, but without the cap it often went up around 40-60fps. As for future movies, the next movie I'm going to be making is The Last of Us: Left Behind. I will be using the PS4 Remastered edition for that. That game is being released on July 29th, and I will start making the movie then. It's a fairly short story so it shouldn't take long. After that I'm not sure what will be next. I have a few ideas lined up, including Assassin's Creed Freedom Cry and Liberation. I may also do the Cold, Cold Heart DLC from Arkham Origins, but I'm not sure yet. At the end of the year I will be working on AC Unity, and next year I will do Arkham Knight, Rise of the Tomb Raider and Uncharted 4 (some of those may be released 2016). Feel free to recommend me some games to try out. The games I listed above will take priority, but if I have extra time, I may look at some of the recommendations as well, but no promises. For the most part, the games I make into movies are going to be third person, and they're probably going to have motion capture or at least very good animated cutscenes, and the gameplay itself should have an overall cinematic feeling to it.